The Free Library of Philadelphia is a selective depository library for U.S. Government publications as a participant in the Federal Depository Library Program. 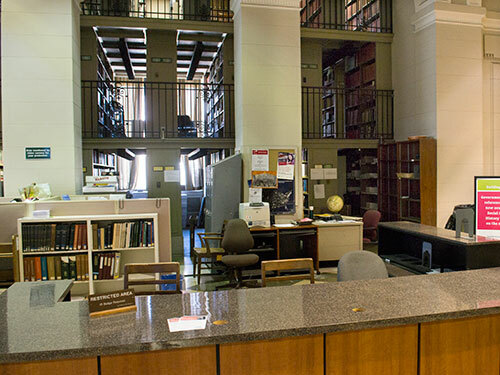 The library has been serving as a congressionally designated depository for U.S. Government documents since 1897. Public access to these documents is guaranteed by public law: Title 44 United States Code. Learn more about our collections and services. Our federal collection is a major resource for census, economic and marketing data; political and election information; legislative histories and statistics. Our depository collections also encompass publications from the Commonwealth of Pennsylvania and the City of Philadelphia. Our legal reference collection houses law reference materials, as well as a circulating collection of books focusing on popular legal topics. Our reference collection includes the U.S. Code Annotated, the Code of Federal Regulations, Purdon’s Pennsylvania Statutes and the Pennsylvania Code. While we do maintain copies of the United States Reports, beginning with 1754 as part of the depository program, we do not carry case law. These collections are maintained by the Social Science and History Department at Parkway Central Library.